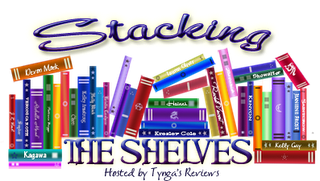 Stacking the Shelves is a weekly meme hosted by Tynga's Reviews for us to showcase any books we've gotten that week, be they gifted, bought, or received for review. I've been meaning to read Touch forever, but whenever I wanted to get it, it was out of print or only available in an edition that for some reason was very expensive. I put of buying Black Heart for a long time because I was reluctant to buy it because of that dreadful cover change, but I finally caved. I hate that all 3 books look really different from one another on my shelves thogh :( This is such an amazing series and I would have loved to own them all in the same edition and format! There are some more books that I ordered that are supposed to arrive hopefully soon... for example I got an email that Unspoken, by Sarah Rees Brennan, was pre-released and sent on its way, so I hope it'll get to me by release day / Tuesday! It's been quiet here as concerns reviews this week. The reason is that I've read one book for a blog tour and can't post the review till next week, and I'm still on the book I started after that. It's been a bit slow going with my reading, but I hope my speed will pick back up soon! 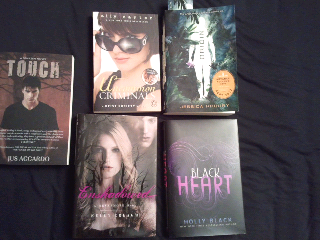 I also got Enshadowed last week though I haven't read it yet. I've heard so many good things about Heist Society and actually have been considering to read it so I'm glad you really liked it. Enjoy your books, Carmen. Happy reading! Nice, I haven't read this ones yet but heard great things about them. Happy reading!